Krampus. 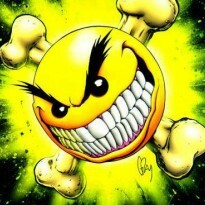 He is an entity children should fear. He has a special place in my heart, especially around Xmas. A kindred spirit of sorts. The story was a great contemporary tale with it's roots deeply embedded in Norse mythology. 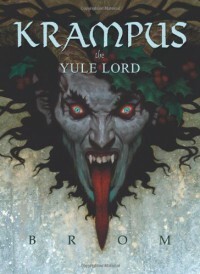 Although I had expected more of a story set ages ago, Krampus: Yule Lord was a story that kept me turning pages. We follow Jesse, a down on his luck musician, forced into petty crime to help make ends meet. I really felt for him. Life could be so much better for him if he could just find the confidence to play his music with his heart and that is all he really wants - a better life. He needs to have that "thing" happen to him to help him spread his wings and fly. And happen it does... when by chance he happens across Santa's sack, a bag imbued with enchantments that will eventually lead Jesse to meet up the Yule Lord himself. I thoroughly enjoyed Krampus: Yule Lord. Character development is big for me and the colorful, detailed characters in Brom's tale really draw the reader into the story. I highly recommend Krampus to anyone who likes a little fantasy mixed in with their gritty crime story. A story, an adventure, that you won't soon forget.